Looking west on NE 85th Street, we see curb ramps being built at the corner of 38th Ave NE. Greenway signage and four-way stop signs mark the route. At the intersection of NE 85th Street and 38th Ave NE, work is going on to extend the Wedgwood Neighborhood Greenway up to NE 89th Street. At NE 85th Street, curb ramps are being built and signage directs bicyclists to continue riding north on 38th Ave NE. Stop signs have been installed on the cross-streets of NE 85th to 89th so that drivers will stop to watch for pedestrians or bicyclists on the Greenway. At NE 89th Street the Greenway turns left (west) and crosses over 35th Ave NE. Over on the west side of the arterial, plans are to continue the Greenway northward on 32nd Ave NE as far as NE 105th Street. This will provide a through-route all the way to Nathan Hale High School. One of the purposes of the Greenway is to provide a route for children to walk or bike safely on non-arterial streets to Wedgwood-area schools. 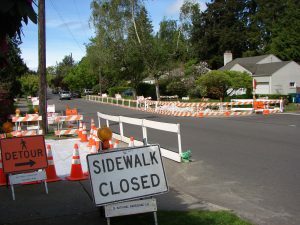 To extend the Greenway to NE 105th Street, the Wedgwood Community Council will work with our neighbors to the north, the Meadowbrook Community Council, on applications to City of Seattle street funds. SDOT truck at work doing street repair in April 2016 in Wedgwood’s northwestern quadrant. In the northwestern quadrant of Wedgwood from NE 85th to 95th Streets, Lake City Way NE to 35th Ave NE, street repair work has begun. 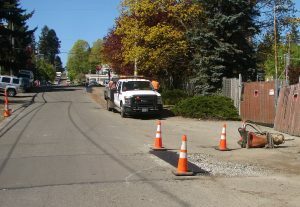 In the month of April SDOT crews have been patching and filling areas of broken pavement in preparation for microsurfacing work to be done in the summer of 2016. Microsurfacing is a protective seal coat which extends the life of pavement. SDOT has a rotation schedule to repair streets every ten years, and 2016 is the year for the northwest section of Wedgwood. Microsurfacing is best done in summertime when schools are out and street traffic may be lighter. The process creates a smooth finish without pebbles, but it needs a couple of hours to “cure” before letting cars drive on it. In other street and traffic news, the repairs on Sand Point Way NE have been completed, and there is no more detour traffic through Wedgwood. Congestion on 35th Ave NE at NE 75th Street is always heavy, however, especially at evening rush hour. The Wedgwood Community Council has long advocated for left-turn lanes for east-west travel from 35th Ave NE onto NE 75th Street. SDOT representatives have begun the design process for these left-turn lanes but the lanes will not be built until 2017. ← Previous Previous post: Work, Work, Work!